Parents and teachers know that we should encourage our children to read as much as possible. Fostering a love for reading is one of the primary goals of my reading instruction because I know students who love reading will be more motivated to read both in and out of school. The amount children read, also known as reading volume, has a direct and positive effect on their achievement, vocabulary development, cognitive abilities, and knowledge of the world around them (Cunningham & Zibulsky, 2013). Of course, students should read in school as well, but generally, students spend 900 hours a year in school versus 7,800 hours outside of school. Ideally, children should be reading both in and out of school for the best results. Make reading part of the nightly routine. Aside from homework, set aside a few minutes each night to share a book, story, or article. Model good reading practices. 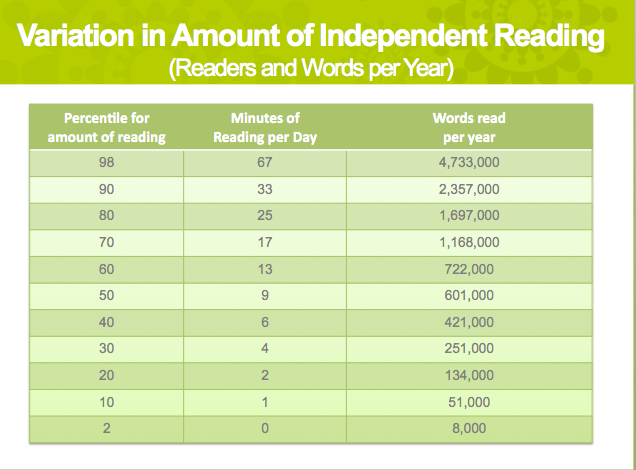 If you model how to make reading a priority, your kids will notice. Talk about books. Ask your children about the stories you’re reading and tell them about what you are reading. Make conversations about books a regular part of their day. Get them hooked on reading! Ask your child’s teachers or other parents about books or series that may interest your child. Reading a series allows kids to become familiar with the characters and may encourage them to want to read more. Make reading rewarding. Make it a special event to get a new book, take a trip to the library, or spend time with you while reading. The more positive associations kids have around reading, the more likely they are to read on their own because it feels good. school.” Reading Research Quarterly, No. 23, pp. 285-303.